Editor’s note: The image above shows three cuckoos of the Shanghai region. 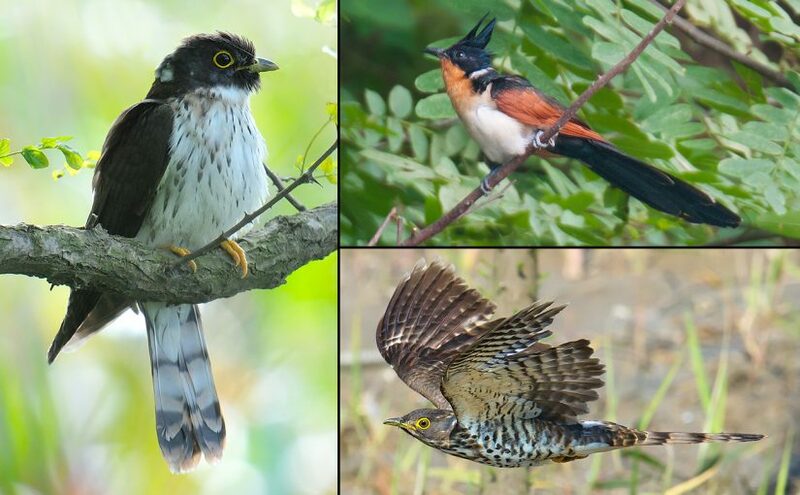 Clockwise from L: Rufous Hawk-Cuckoo, Chestnut-winged Cuckoo, and Large Hawk-Cuckoo. Join us as we study the rich array of cuckoos that passes through Earth’s greatest city. It is spring, and one of the most thrilling moments of the bird migration in Shanghai is upon us—the passage of the Cuculinae, the Old World brood-parasitic cuckoos. Nowhere in the world is the diversity of this group greater than in eastern Eurasia, and here in Shanghai we get an enviable selection. Let us examine our Shanghai-area parasitic cuckoos and learn how to tell them apart. We can divide the Shanghai-area brood-parasitic cuckoos into two categories: the mainly grey, slender-bodied Cuculus cuckoos and the non-Cuculus cuckoos. We will look at the non-Cuculus cuckoos first. The non-Cuculus parasitic cuckoo that one is most likely to see in Shanghai is Large Hawk-Cuckoo Hierococcyx sparverioides. In the microforests at Cape Nanhui and once, to my surprise, in inner-city Zhongshan Park, I have heard the scream of “Brain fever!” The species breeds in nearby Jiangsu and Zhejiang. 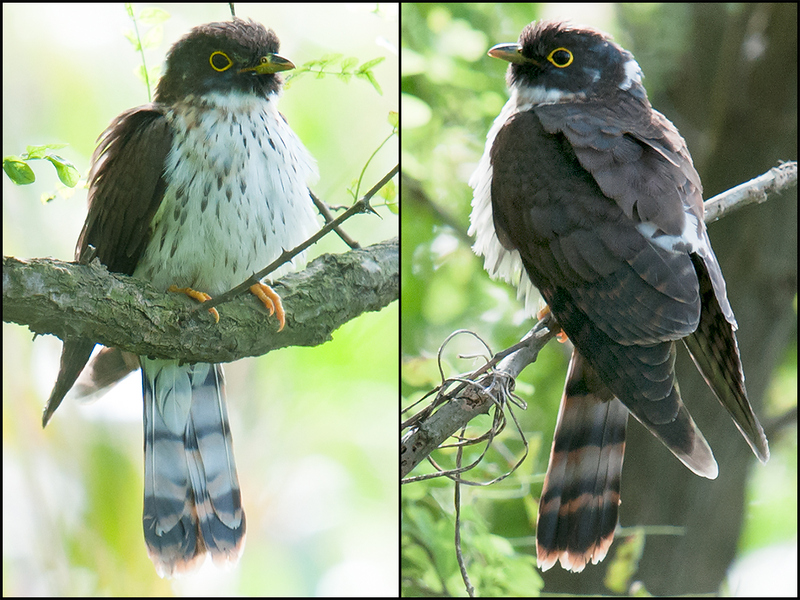 The hawk-cuckoos mimic sparrowhawks, an amazing feat of evolution. The resemblance serves, scientists say, not to increase stealth but to decrease it. Passerines, mistaking the intruder for a sparrowhawk, mob it, thereby giving away the location of their nest. After the tumult dies down, the hawk-cuckoo quietly swoops in and lays her egg. Hawk-cuckoos have bills quite unlike those of the sparrowhawks that they otherwise mimic. L: Japanese Sparrowhawk (Craig Brelsford). R: Large Hawk-Cuckoo (Kai Pflug). When it comes to the business of eating, however, the masquerade ends. The hooked bill of a sparrowhawk is a butcher’s tool, made for stripping the flesh of vertebrates from bone. The bill of a hawk-cuckoo is blunt, the utensil of a caterpillar-eater. Need a quick differentiator between “sprock” and hawk-cuckoo? Look to the bill. Large Hawk-Cuckoo shows heavy barring and streaking on the throat, breast, and belly and varying degrees of rufous on the upper breast. L: Cape Nanhui, Shanghai, April (Kai Pflug). Top R: Longcanggou, Sichuan, May (Craig Brelsford). Bottom R: Old Erlang Road, Sichuan, June (Craig Brelsford). Another separation we Shanghai birders need to make is that between Large Hawk-Cuckoo and Rufous Hawk-Cuckoo Hierococcyx hyperythrus. If seen clearly, adult Large Hawk-Cuckoo and Rufous Hawk-Cuckoo are readily separable. Rufous Hawk-Cuckoo shows a belly washed rufous with faint streaks. Large Hawk-Cuckoo is heavily barred and streaked and has the rufous coloring confined to the upper breast. 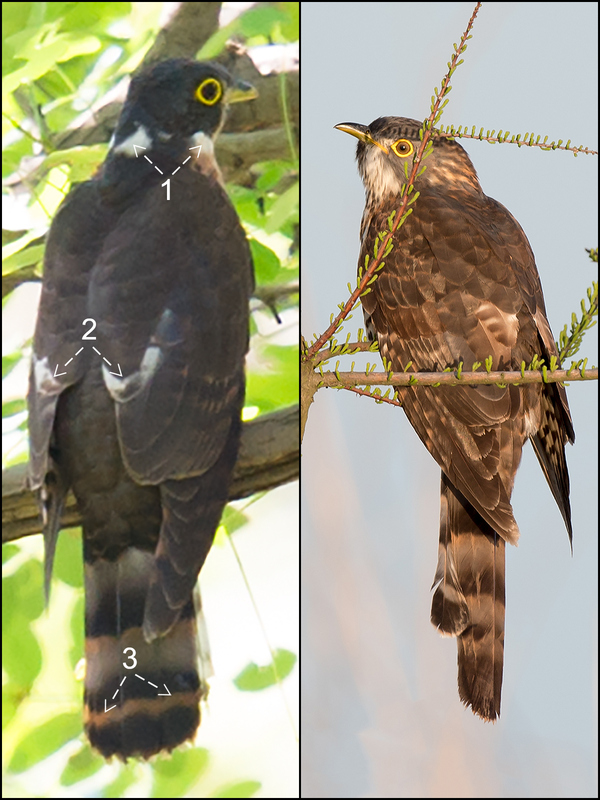 Adult Rufous Hawk-Cuckoo (L) shows (1) white neck-sides and nape patch, (2) white scapular crescents, and (3) a rufous border to the black subterminal band on the tail. 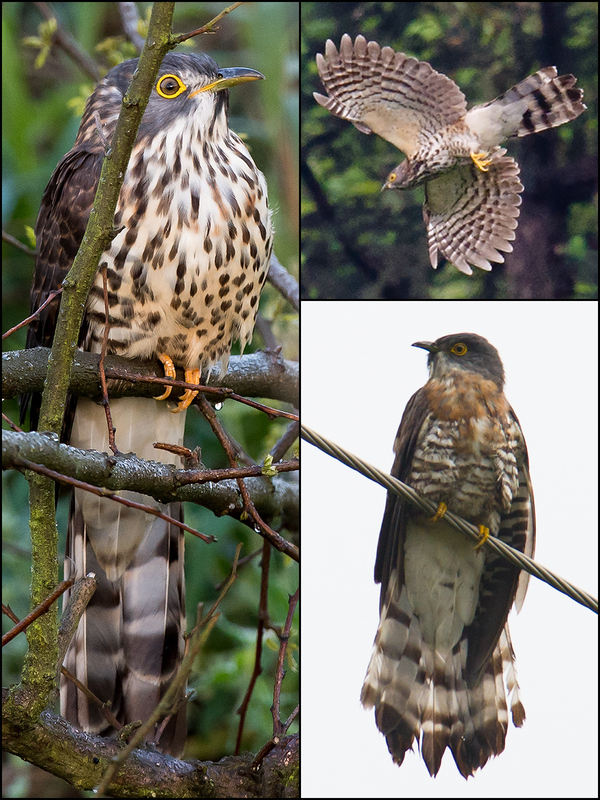 Large Hawk-Cuckoo (R) shows none of these. L: Original Magic Forest (32.567487, 120.996980), Yangkou (Rudong), Jiangsu, September (Craig Brelsford). R: Cape Nanhui, Shanghai, April (Kai Pflug). Adult Rufous Hawk-Cuckoo shows a white spot on the nape, white neck-sides, and white scapular crescents. These features may also be visible in sub-adult Rufous Hawk-Cuckoo. Large Hawk-Cuckoo shows none of these in any plumage. Size differences may be appreciable. An average Large Hawk-Cuckoo is 15 percent larger than Rufous Hawk-Cuckoo. The tails differ, with the black subterminal band of Rufous Hawk-Cuckoo being bordered by a rufous line above and by the rufous tail-tip below. 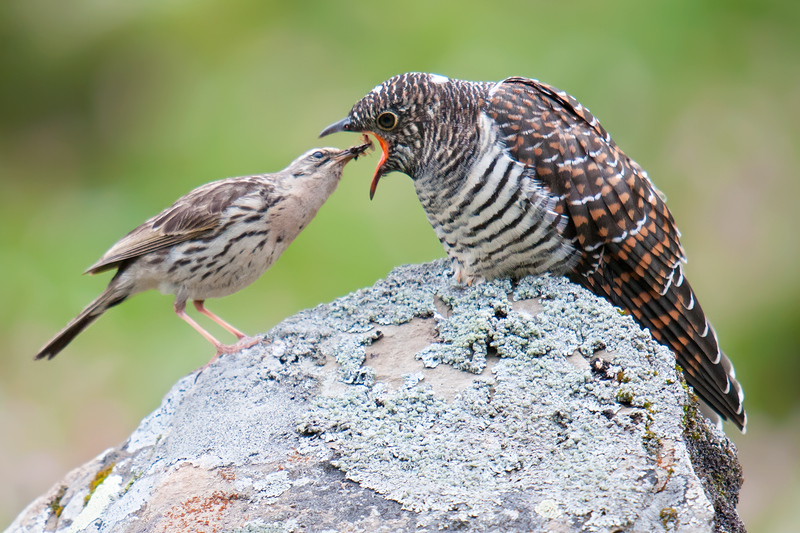 These rufous areas may be visible in immature cuckoos. Asian Koel shows pronounced sexual dimorphism. L: female, 2 June 2016, Nanhui (Kai Pflug). R: male, 17 May 2015, tree plantation (32.855576, 120.896557) in Dongtai, Jiangsu (Craig Brelsford). Eudynamys scolopaceus chinensis is the northernmost-breeding race among the koels, a small, mainly tropical group. 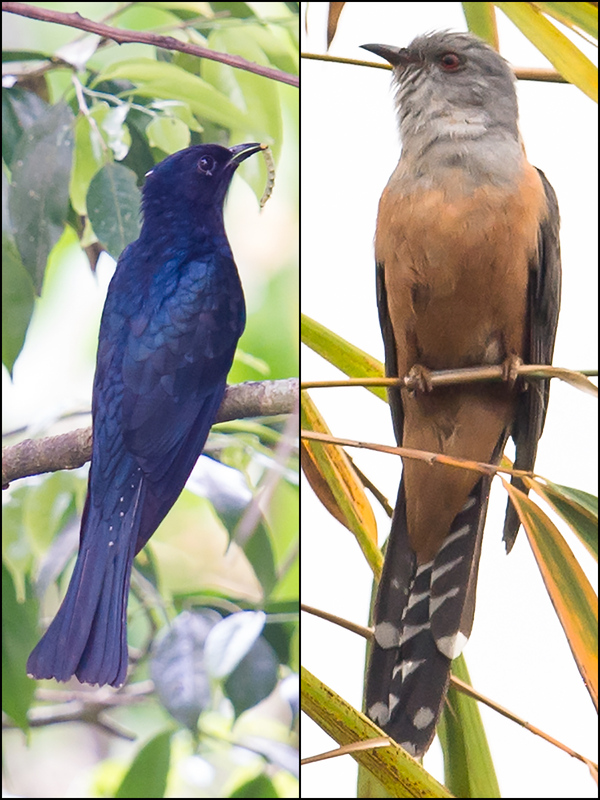 The other non-Cuculus parasitic cuckoos of the Shanghai region are Asian Koel Eudynamys scolopaceus and Chestnut-winged Cuckoo Clamator coromandus. Neither poses great ID challenges. In China, Asian Koel ssp. chinensis breeds mainly south of the Yangtze River. With its familiar “koh-EL” song, Asian Koel is as easy to hear as it is hard to see in the dense forests where it is almost invariably found. It shows strong sexual dimorphism, with the male entirely glossy bluish-black and the female brown with whitish streaks, bars, and spots. I have yet to see Chestnut-winged Cuckoo in Shanghai. It has been noted at Tongshan Forest Park (32.348637, 119.106915) in Yangzhou, Jiangsu, and I have noted it at Laoshan (32.071265, 118.560699) in Nanjing as well as in Zhejiang in the Tianmu Mountains (30.344148, 119.440201). With its glossy-black erectile crest, rufous wings, and long, black tail, the species is unmistakable—if you can manage to see it. Five Cuculus cuckoos have been claimed for Shanghai: Lesser Cuckoo Cuculus poliocephalus, Indian Cuckoo C. micropterus, Himalayan Cuckoo C. saturatus, Oriental Cuckoo C. optatus, and Common Cuckoo C. canorus. The latter breeds in the area, parasitizing the nests of Oriental Reed Warbler in the reed beds at Cape Nanhui. Its famous song, perhaps the best-known bird sound in the world, is hard to miss at Nanhui in May. Lesser Cuckoo and Indian Cuckoo breed in the region and are recorded on passage in Shanghai. 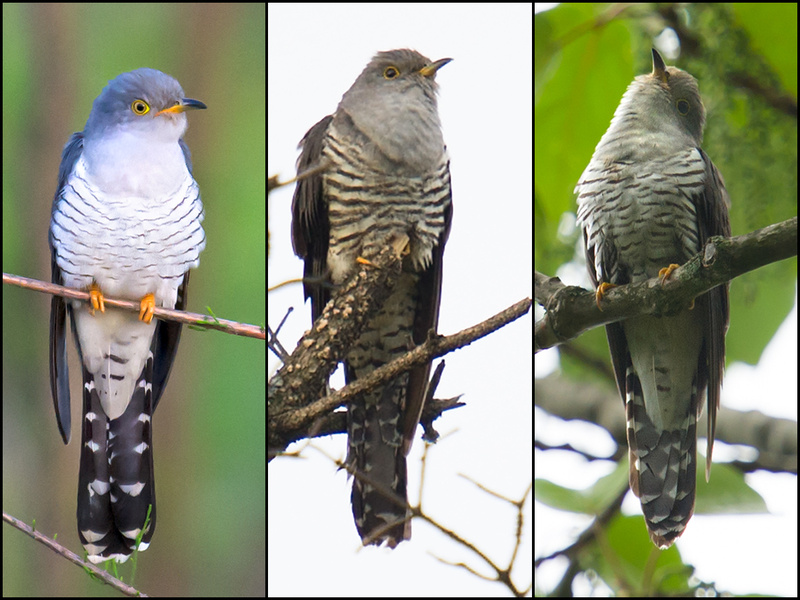 Himalayan Cuckoo and Oriental Cuckoo may pass through Shanghai, but inasmuch as in size, plumage, and bare parts they are nearly identical to each other and very close to Common Cuckoo, and because they rarely (if ever) sing in our region, it is impossible to know how common they are. Hear the song of any of these Cuculus, and you will have your ID; even the similar songs of Himalayan and Oriental are readily separable. If your cuckoo is silent, however, then you will need a closer look. 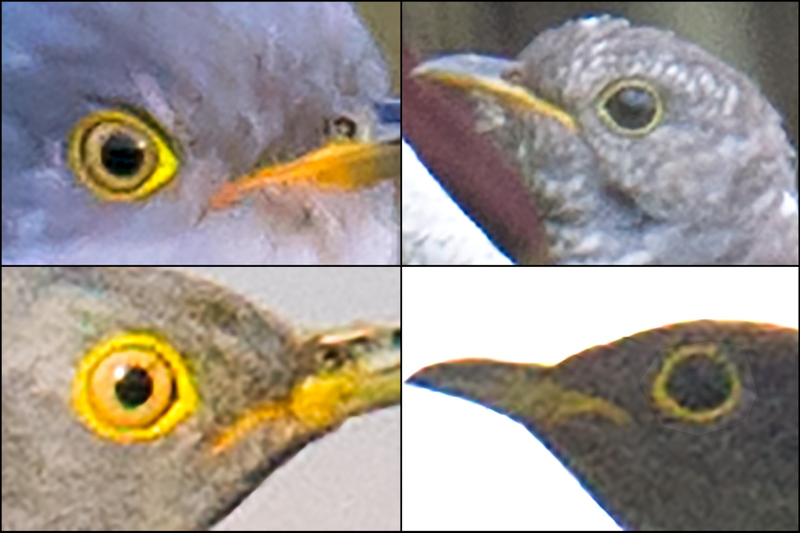 Lesser Cuckoo and Indian Cuckoo have a brown iris, Common a bright-yellow iris. Lesser Cuckoo is the size of a thrush; Indian Cuckoo is a third larger; Common Cuckoo is larger still, approaching the size of a female Eurasian Sparrowhawk. In autumn, juveniles pass through Shanghai. They are silent and nearly impossible to identify to species. 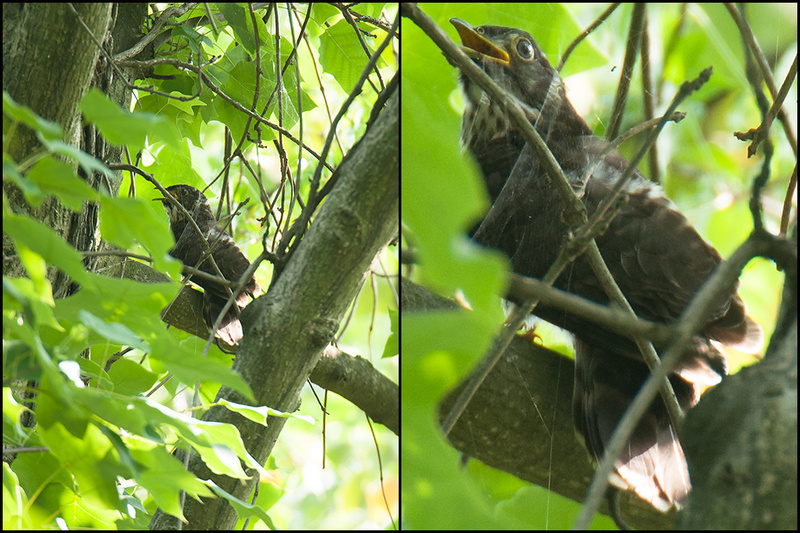 If one gets a close look at juvenile Lesser Cuckoo, however, one may appreciate its thrush-like size. If you happen to be on the breeding grounds, then you can attempt an ID according to the species of the foster parent. 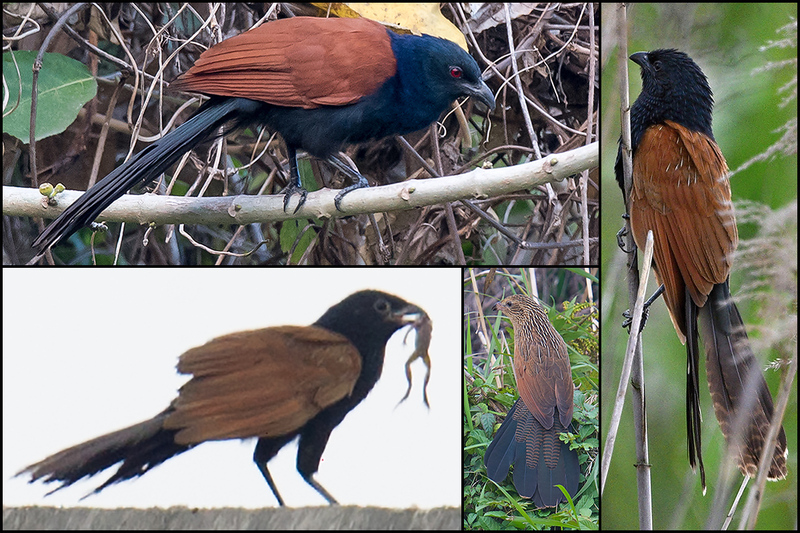 Top L: Greater Coucal, Nabang, Yunnan, March (Kai Pflug). R: Lesser Coucal (adult), Nanhui, May 2015 (Kai Pflug). Bottom L: Lesser Coucal (adult), Nanhui, 11 Sept. 2016 (Craig Brelsford). Bottom C: Lesser Coucal (juvenile), Nanhui, 19 Nov. 2016 (Craig Brelsford). Lesser Coucal Centropus bengalensis is the good guy of the Shanghai cuckoo world. Unlike all the other cuckoos recorded in Shanghai, but like most of the cuckoos in the world, the coucals are not brood parasites. Lesser Coucal, resident in Shanghai, builds a dome nest on the ground. 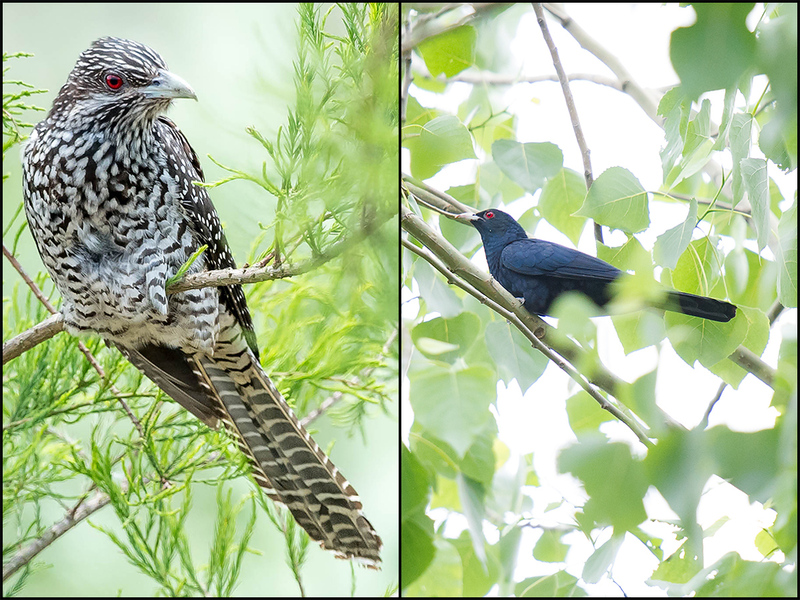 Lesser Coucal may be the only non-Cuculinae cuckoo in Shanghai, but it shares at least one trait with the brood parasites: It is very unobtrusive. Look for Lesser Coucal in areas of thick vegetation near water, such as the strips of reed bed along the canals at Cape Nanhui. If you find one, count yourself lucky. Greater Coucal Centropus sinensis occurs south of our region. It is nearly half again as large as Lesser Coucal and has a cleaner and glossier mantle, a thicker bill, and a redder iris. Fork-tailed Drongo-Cuckoo Surniculus dicruroides (L) and Plaintive Cuckoo Cacomantis merulinus, brood-parasitic cuckoos from south China. Both occur just south of our region, to Zhejiang. In drongo-cuckoos, independently from but in the same manner as in hawk-cuckoos, evolution created birds that bear an astonishingly close resemblance to species in a distantly related family. L: Skytree Nature Reserve (21.62801, 101.58878), Xishuangbanna, Yunnan, March (Craig Brelsford). R: Yingjiang, Yunnan, March (Kai Pflug). All cuckoos from the Shanghai area are covered here. I make my recordings with my handy little Olympus DM-650. In this post I used several of Kai Pflug’s bird images. Kai and I have worked together from the earliest days of shanghaibirding.com, and I have published dozens of Kai’s photographs on this site. Kai made a notable contribution to my October 2016 post “ID Workshop: Paradise Flycatchers.” In September 2016 I wrote about Kai’s work cleaning up the litter at Nanhui. Kai is from Germany, lives in Shanghai, and is an active member of the Shanghai Birding WeChat group. Thanks also to Shanghai Birding member Jonathan Martinez for his advice on Fork-tailed Drongo-Cuckoo and Plaintive Cuckoo. Brazil, Mark. Birds of East Asia. Princeton University Press. Cuckoos, pp. 254-9.
del Hoyo, Josep, et al., eds. The Handbook of the Birds of the World. Lynx Edicions. Vol. 4, “Sandgrouse to Cuckoos.” Cuculidae (pp. 508-607) by R. B. Payne. Two years ago I had excellent views of Chestnut-winged Cuckoo at Nanjing in some extensive woodland on a hill where there is a big temple. Also at the site were Fairy Pitta, Forest Wagtail and Brown-Chested Jungle Flycatcher amongst a lot of others. 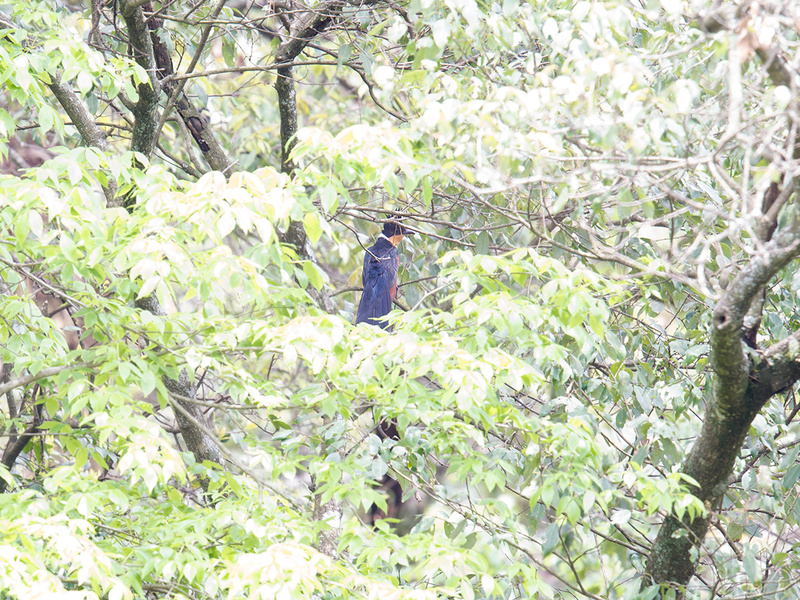 Hi Mike, You had your view of Chestnut-winged Cuckoo at Laoshan, on the north shore of the Yangtze River in Nanjing. That’s where I got my photo of Chestnut-winged Cuckoo at the top of this post. Hi Craig, I’m Kelvin, I live in Shanghai, I like photography as a hobby and quite interested in birds, I wonder if I can join the shanghai birding wechat group. You can! Friend me on WeChat (WeChat ID: craigbrelsford), message me saying you want to join Shanghai Birding, and I’ll add you.